Oct. 18, 2017 11:00 a.m.
Agriculture Minister Lana Popham says her letter to a B.C. salmon farm company last week was not a threat to cancel salmon farm tenures in a disputed area north of Vancouver Island. Marine Harvest Canada went ahead with restocking its Port Elizabeth farm near Alert Bay on the weekend despite the formal request to stop, and an RCMP boat attended the area to maintain order with protesters who have occupied area salmon farms since late August. 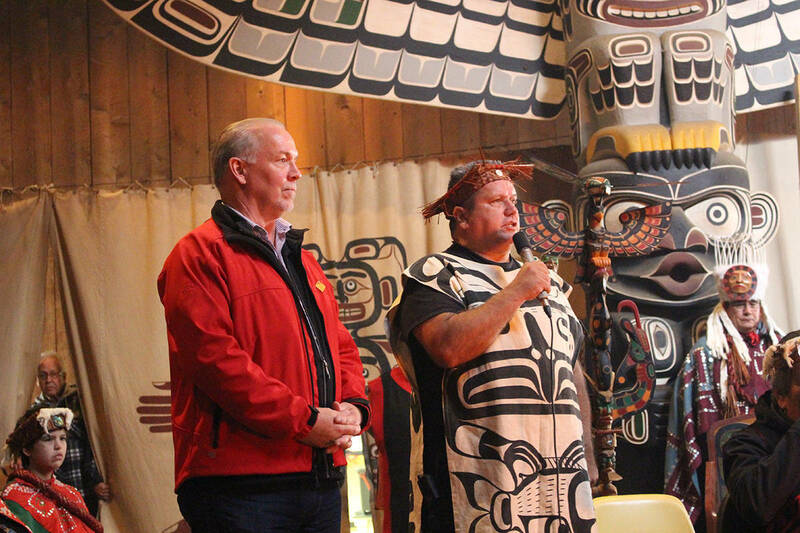 Popham’s Oct. 13 letter to Marine Harvest Canada managing director Vincent Erenst said the restocking “comes at a very sensitive time in government-to-government discussions” with aboriginal people who assert territory in the Broughton Archipelago and oppose ocean-based salmon farms. The province has 18 salmon farm tenures that are coming up for renewal next year. In an interview with Black Press, Popham said the letter was not meant as a threat, and she understands the company’s decision to go ahead with restocking its salmon. Marine Harvest communications director Ian Roberts said the restocking was put off as long as possible, and the need to proceed and maintain the health of live salmon was communicated to the government. He added that the protesters have refused to meet with company officials, and Marine Harvest is willing to talk about solutions, including relocating salmon farms. Popham’s letter was copied to federal Fisheries and Oceans Minister Dominic LeBlanc, who has licence authority over offshore salmon farms on both the Pacific and Atlantic coasts.